I was third in the supermarket queue when the cashier came across an item which wouldn’t scan. It didn’t have a barcode. So she stood up saying “I won’t be a minute” and headed off to check the pricing. The customer turned to the customer next in line, who I’ll call Mrs B, and apologised profusely for delaying her. The customer at the front smiled sympathetically but didn’t follow up on the outburst. Mrs B, on the other hand, carried on muttering under her breath until the cashier rushed back less than 90 seconds later. Then Mrs B got served. Sullen-faced and avoiding eye-contact she paid for her goods. And left. I was next in line and chatted with the cashier while she scanned my items and I packed them. No. I passed Mrs B in the mall about 5 minutes later. She was standing and talking with a man who seemed to be Mr B. They were talking animatedly – lots of frowning and head-shaking and varied voice tonalities. So, as I passed them (deliberately closely and purely in the interests of research, you understand…) I was amazed to discover that, yes, she was still going on about the delay caused by the unpriced item. And how terrible it was that she had to wait. And how stores should have items properly priced. And how customers shouldn’t be delayed like that. It was now a good 10 minutes since she’d been delayed… for 90 seconds. Anyway, in my ‘hippy phase’ there were a few books that were obligatory - if you wanted to be considered ‘cool’, that is. And being considered cool by other cool hippies was important – there was a hierarchy of cool-ness, you see. Anyway, these books included The Hobbit, Lord of the Rings, Siddhartha, The Medium is the Massage, Stranger in a Strange Land, The Little Prince – and, towards the end of my hippy phase, Zen and the Art of Motorcycle Maintenance. Now I can’t remember much about Zen and the Art except for one moment that more or less changed my life… and that’s worth remembering. The author is on a 17-day motorcycle journey through the US. In one chapter he’s cruising along and suddenly his travelling reverie is disturbed when he realises that he is being tail-gaited by a car. He decides not to get angry or get involved in a race with the car. Instead he pulls over and allows it to pass him. And that’s the moment that had such an impact for me. I realised that since I was a youngster I’d allowed the views and behaviour of other people to influence my mood. And especially to ‘make’ me irritable. This one incident in the book stopped me short. I still remember having to put the book down and go off for a walk to think about the implications. It made me aware of how I’d grown up believing that behaviour, moods, and opinions of other people actually caused my moods. And this recognition was like a bombshell: They are controlling my mood – because of the way that ‘I’ think about ‘their’ actions. It was a stunning revelation - which was reinforced a few years later when I came across the NLP Meta Model and especially the Cause & Effect category. Essentially this Meta Model category describes how events cannot cause our emotions – in reality it is our thinking about the events which controls our mood. The event? Or our thinking about the event…? Mrs B wasn’t made angry by the supermarket staff not putting a barcode on the item. Nor by the cashier being so helpful in leaving her desk to get the right price as quickly as possible. Nor by the minimum-waged employee who forgot to put the bar code on the item. Mrs B’s mood was being created by Mrs B’s thinking about the event. And her mood was reinforced by her continuing to talk about it to Mr B. And, no doubt, by thinking about it for the rest of the afternoon. And, it seems pretty likely, by telling her friends and family over the coming days about her traumatic delay. So a sizeable chunk of Mrs B’s life that day, and maybe on subsequent days, will have been wasted by her thinking about how the world and the supermarket conspired to delay her for a whole 90 seconds. The two young monks were heading through forest on their way back to their temple. Their journey involved wading across a wide and fast flowing river. When they reached the crossing point they saw a young woman standing on the bank. She was quite distressed because she was unable to get across to get home. One of the monks offered to help and so he carried her across the river on his shoulders. On reaching the other side he set her down on the river bank and she thanked him and the two monks continued on their way. “Leave it by the River”? I first came across the monks’ story shortly after reading Zen and the Art. Since then ‘leave it by the river’ has become a ‘saying’ in our household. We use it whenever either of us (often me) begins going over past events or dragging up stuff that should be left alone – whether this be hours ago or years ago. “Anything to be done about that? Or learned from that? Yes? Then do that now. No? Then leave it by the river. 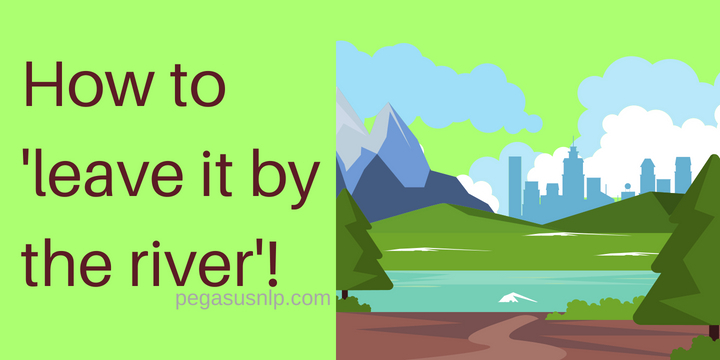 ‘Leave it by the river’ is a handy way of staying focussed on what’s important.